Old Town/Orono coach Denis Collins watches the action from the bench during a game in Houlton in this 2016 file photo. Collins has decided to step down as the team's coach. Denis Collins, who led the fifth-year Old Town-Orono hockey program to the Class B hockey state championship last season, has decided to step down from the post due to travel requirements associated with his work. Collins, who works for the state of Maine as a regional manager in the department of labor, said his daily commute to Augusta, which he began 13 months ago, proved to be too much. Old Town-Orono practiced at 5:30 a.m. at Alfond Arena in Orono so that required him to be up by 4:30. And he often wouldn’t get home from Augusta until 8 p.m.
Former archrivals Old Town and Orono merged into a cooperative team when Orono was in danger of losing the program due to low numbers. Collins, who previously had coached at Bangor High, was named the head coach. After going 2-16 in their first season, the Black Bears showed a steady progression. They earned a berth in the 2016-2017 Class B North championship game and won the state title last winter. “Denis has played a vital role in the rapid and unexpected growth of the co-op hockey program,” said Orono High School athletic administrator Mike Archer. “It was a steady growth in his five years culminating in two very special seasons in 2016-17 and 2017-18. I will always be grateful to him for taking the chance on a program in which there were five wins combined between the two schools the previous year. Old Town-Orono became the first cooperative boys team to win a state championship in any sport. 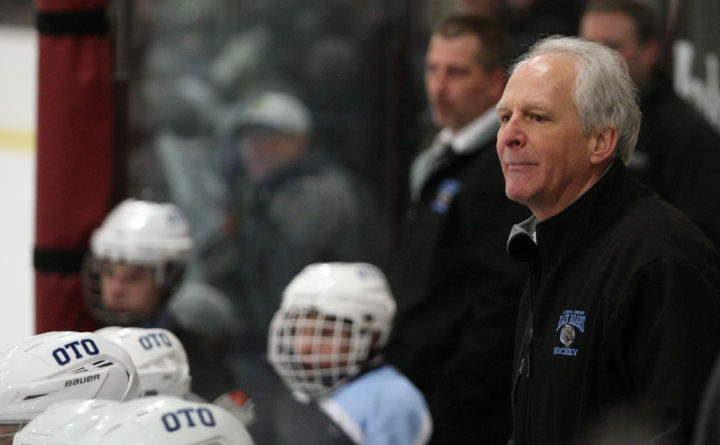 The Black Bears compiled a 20-1 record after going 16-3-2 two years ago. “I’m glad I’m leaving on a high note. I never expected us to win a state championship that quickly,” said Collins, who was assisted by longtime Orono High assistant Chris Thurlow, former Old Town High standout Cory Thibodeau and Lucas Shorette. Collins admitted he thought about stepping down after the 2016-2017 season but he had a “great group of kids like Ben Allan-Rahill and Trent Lick,” so he decided to return for one more year. Collins was a former Eastern Maine Class A Coach of the Year at Bangor High in 2011-2012, when the Rams went 13-5. Collins said he will probably keep his hand in coaching on a limited basis. He has worked with Guy Perron and the Junior Black Bears program. The new Orono coach will inherit a solid nucleus and an expected freshman class of at least 12 players. The Black Bears lose Class B North Player of the Year Jacob Dubay, All-Class B North first-team defenseman Josh Wheeler, third-teamers Allan-Rahill and Finnish exchange student-defenseman Antti Jarvikare, and veteran defenseman Austin Soucy to graduation. The team returns sophomore forwards Tyler McCannell and Sam Henderson, who scored 25 and 15 goals, respectively. Also back are All-Rookie choice Tanner Evans (16 goals), Lick (10 goals), defensemen Cam Tower and Dylan Street, and goalie Kohle Parker.